Timmy briefs our PADI Discover Scuba Diving participants on their open water dive! 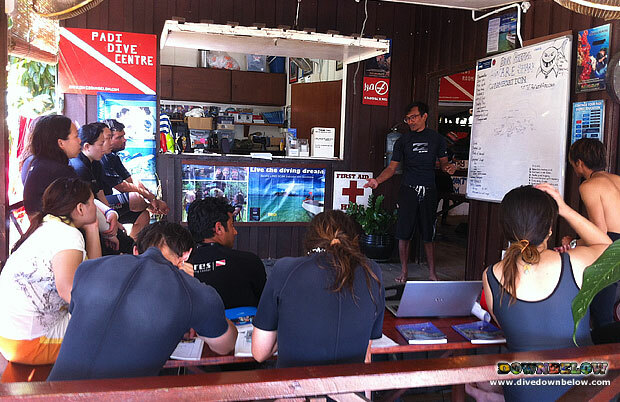 Home/Discover Scuba Diving, News/Timmy briefs our PADI Discover Scuba Diving participants on their open water dive! Timmy is one of our full time PADI Open Water Scuba Instructors and he is kept busy with lots of experience teaching after qualifying last month! Timmy conducts the PADI Discover Scuba Diving program, and it’s such a popular program with our clients, that there are four PADI Instructors to supervise the nine student divers in total. Our top priority during the conduct of all dive training is safety because the student is provided a high level of attention from their Instructor and as a result master scuba diving skills easily. To discover the incredible sport of scuba diving, contact us at our Head Office in KK Times Square to arrange an itinerary for a program catered to your individual needs, and explore attractions Sabah has to offer! By Joanne Swann|2014-03-13T08:51:46+08:00March 13th, 2014|Discover Scuba Diving, News|Comments Off on Timmy briefs our PADI Discover Scuba Diving participants on their open water dive!